The company said Google Editions marks its first effort to earn revenue from its ambitious Google Books scanning project, which attempts to make millions of printed books available online. Although the scanning program has faced complaints from authors and publishers over copyright, Google Editions will cover only books submitted and approved by the copyright holders when it launches next year. Tom Turvey, head of Google Book Search's publisher partnership program, said Thursday the e-book market is evolving to allow access of books from anywhere and from any device. 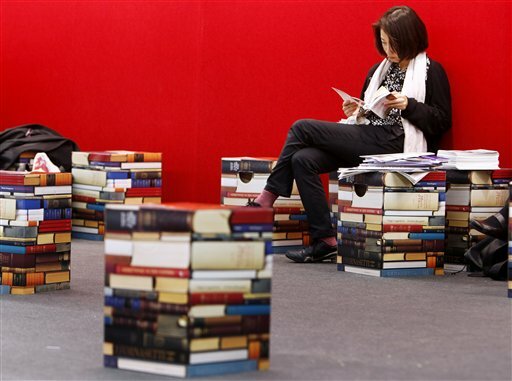 "We expect the majority will go to retail partners not to Google," Turvey said at the 61st Frankfurt Book Fair. "We are a wholesaler, a book distributor." Google will try to keep transactions simple, Turvey said, possibly by using its existing Google Checkout platform. Google will collect 55 percent of the revenue and turn a "vast majority" of that to the retailers. The rest will go to the book's publisher, who will set prices. If the books are being sold directly to consumers by Google, it will take 37 percent and give publishers 63 percent. Turvey expects the program will start with 400,000 to 600,000 books in the first half of 2010. Books bought through Google Editions will be stored on the device and readable without a live Internet connection. Electronic books are gaining in popularity, led in part by devices like Amazon's Kindle and Sony Corp.'s new Reader Pocket Edition. In 2008, U.S. e-book sales totaled $113 million _ up 68 percent from 2007 but still a fraction of the estimated $24.3 billion spent on all books, according to the Association of American Publishers. Sony's eBook Store includes more than 100,000 books, as well as a million free public-domain books available from Google. The Kindle Store currently has more than 330,000 available titles. The Kindle can only download books from Amazon's store, while Sony's Readers can display texts sold in the "epub" format _ an open standard supported by the International Digital Publishing Forum that numerous publishers use to make e-books. Turvey said that Google was not focused on any particular reader or its format. The new Google program comes as the Mountain View, Calif.-based company continues to fend off criticisms over its book-scanning program. On Thursday, Chief Legal Officer David Drummond said criticism from the German government resulted from a "misunderstanding" regarding book copyrights. German Chancellor Angela Merkel said in her weekly video podcast last weekend that the Internet carries "significant dangers" for the rights of authors. "For the (German) government, it is clear that copyright also must find its place on the Internet," she said. "That is why we reject books simply being scanned in without any copyright protection, as is being done by Google." Drummond said at the press conference that Google Books is using the U.S. "fair use" principle as its guide in the United States. A U.S. District Court judge in New York set a Nov. 9 deadline for Google and copyright holders to submit a new agreement to settle a dispute over Google's effort to attain digital rights to millions of out-of-print books. The U.S. Justice Departmen filed papers last month, saying the original agreement "raises significant legal concerns" and was likely to conclude that it breaks federal antitrust law. Drummond said Google expects that lawsuit to be resolved by November, with a few changes to the deal it reached with U.S. publishing firms a year ago. Associated Press Writer Laura Stevens contributed to this report.